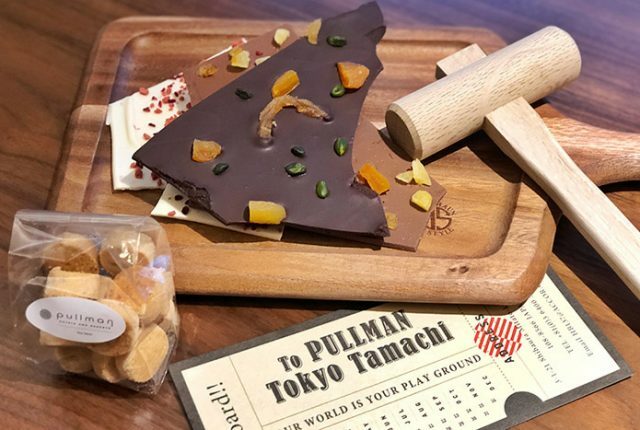 Take one rumbling volcano, a sparkling blue harbour filled with galleons and gondolas, and seven enchanting ports filled with thrills, whimsy, creativity and adventure. 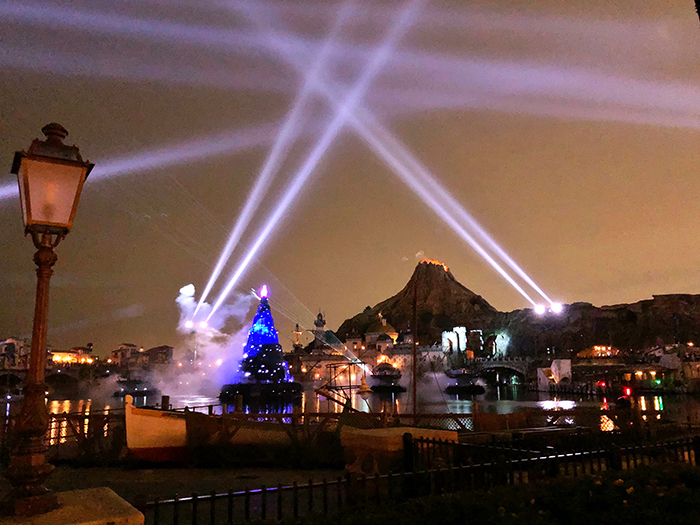 Then add state-of-the-art special effects, a side of sushi, and you’ve got the incredible Tokyo DisneySea, a one-of-a kind Disney Park that I think might just be the most beautiful in the world. 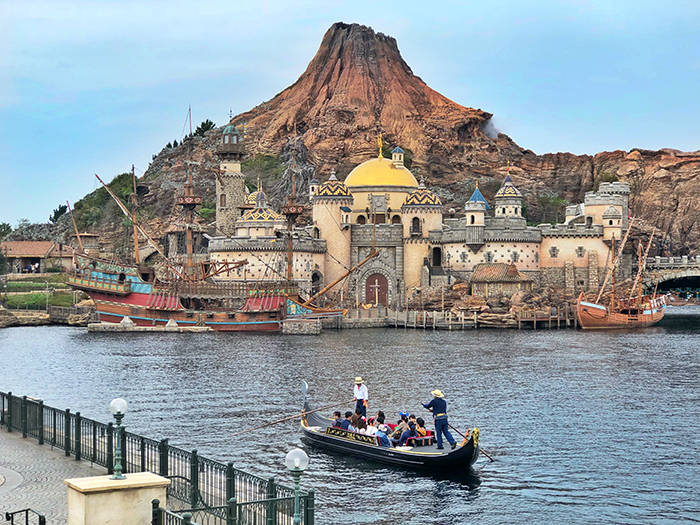 Located alongside Tokyo Disneyland, Tokyo DisneySea is a stand-alone Disney park inspired by the myths and legends of the sea. 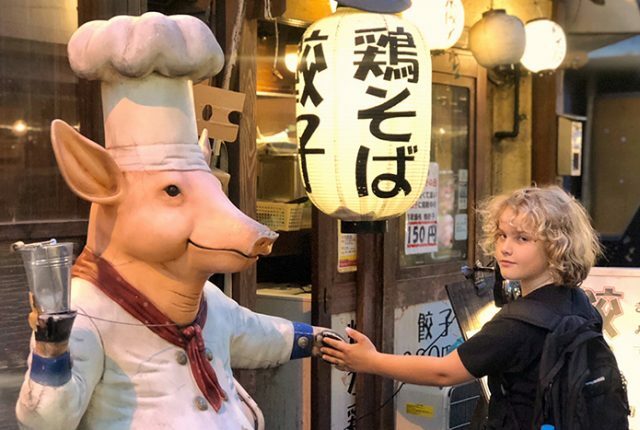 It offers visitors an exciting and unique experience that combines modern day Japanese technology and kawaii quirks with the magical traditions and celebrated hospitality that Disney has perfected during its six decades of theme park wizardry. 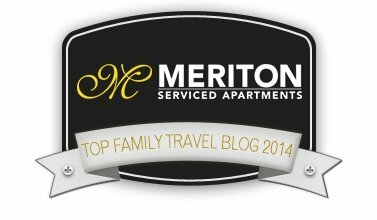 And, in true Disney style, it’s fabulous for families! non-stop nautical fun would leave us. Forget about being the happiest place on earth, this place is the happiest place on water! 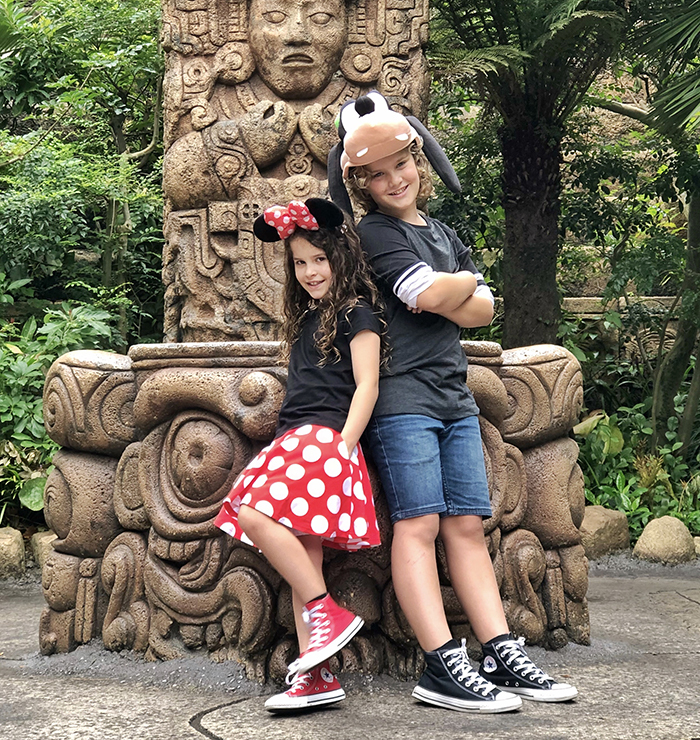 Tokyo DisneySea with kids is pure liquid magic and its every incredible detail, immersive worlds, innovative rides, imaginative attractions and live entertainment spectaculars – many of which are absolutely unique to this park – provide a flotilla of jaw-dropping, giggle-inducing fun for the whole family. The dazzling Mediterranean Harbor welcomes us into the park in style, before leading to six more immersive ports of call: American Waterfront, Lost River Delta, Port Discovery, Mermaid Lagoon, Arabian Coast, and Mysterious Island, complete with erupting volcano. 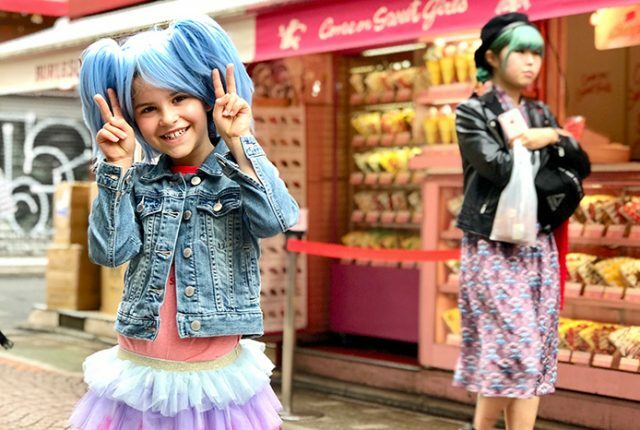 Our first stop though is the stores to kit the kids out in the requisite ears, backpacks and, in Sugarpuff’s case, a spotted skirt so she could go full Minnie Mouse! Geared up, grinning and ready to go, we enter the gates of Mediterranean Harbor. 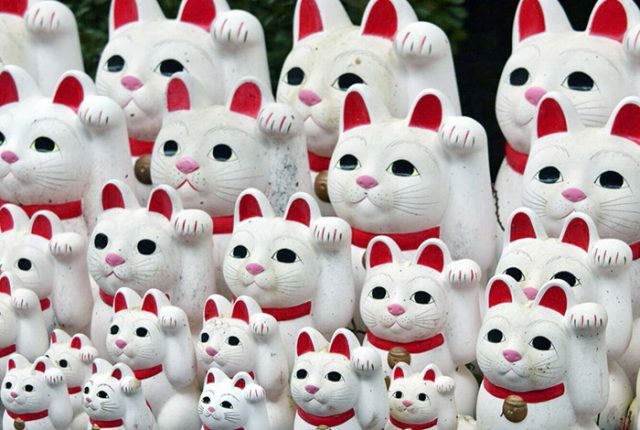 It feels like we’ve stepped through a vortex out of Tokyo and into Venice. The attention to detail is incredible. The kids giggle and shout “Ciao” at passers-by as we float through the canals and under bridges, being serenaded by our gondolier, for all the world as if we were actually in Venice. Well, except that there’s a volcano shooting flames in the distance. The kids nab a huge bucket of delicious caramel popcorn from a stand, Raffles strapping it around his neck, so they can clamber around Fortress Explorations, an interactive play area with exhibits where you can study the planets and earth’s rotation, operate nautical instruments, see a replica of da Vinci’s iconic Flying Machine and soak up the view of Mediterranean Harbor. From there we head to the American Waterfront, themed to look like New York Harbour at the turn of the 20th Century. The whole area is epic in scale, overlooked by the hulking S.S. Columbia liner and the shadowy turrets of the Tower of Terror, which we steadfastly avoided, given our aversion to having our wits scared out of us. 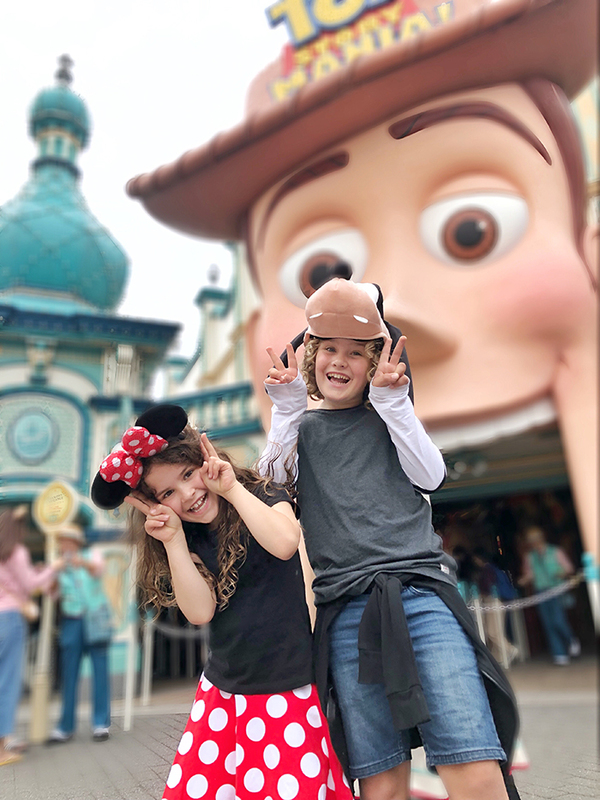 Happily, it is also home to Toy Story Mania!, a Coney Island style attraction where we leap on board a 4-D shooting game ride, Raffles absolutely determined to beat me and his little sister with the highest score. The ride is huge fun and the kids jump up and down, eager to go again, before Sugarpuff spots an ice cream stand. 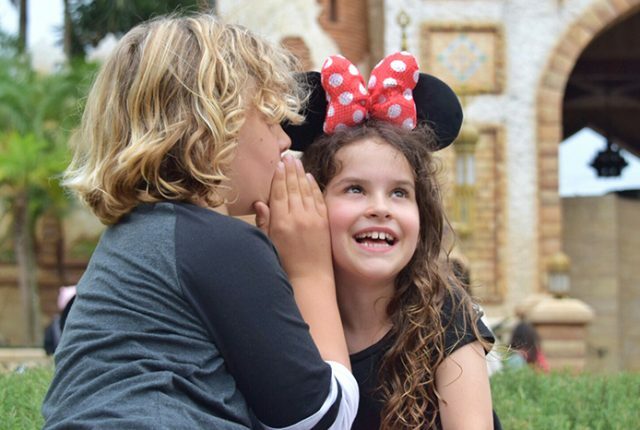 She gobbles a raspberry and peach flavoured Minnie Mouse ice treat while Raffles slurps on the Mickey Mouse equivalent as they are entertained by a street performer conjuring up magic, utterly mesmerised by his cleverness. We decide to take a break and grab an early lunch of succulent fried chicken and waffles at the cavernous Dockside Diner before leaping aboard the Electric Railway, bound for Port Discovery. It’s straight to Aquatopia, a whirling wonder that’s like a tea cup ride on water, at the retro futuristic Port Discovery. This port of call brings the fictional Marine Life institute from Pixar’s Finding Dory to life, and my aquatic duo are excited. Not least with the Finding Dory themed store, stocked with all their favourite Pixar pals including cranky Hank the octopus, Nemo the clownfish, absent-minded Dory and Crush the turtle, dude! The Nemo and Friends SeaRider is another huge hit, proving to be one of the kids’ favourite rides of the day. As they enter an underwater vehicle, the SeaRider, they are magically reduced in size and shot underwater to swim and explore with Nemo, and his pesce pals. 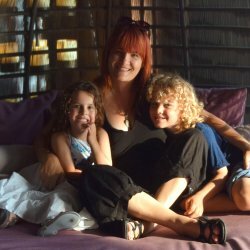 The kids’ smiles couldn’t be wider when we disembark, full sized once more. But there were more fishy adventures in store at the dramatic, coral strewn Mermaid Lagoon, where we find ourselves bathed in a sea blue wonderland. 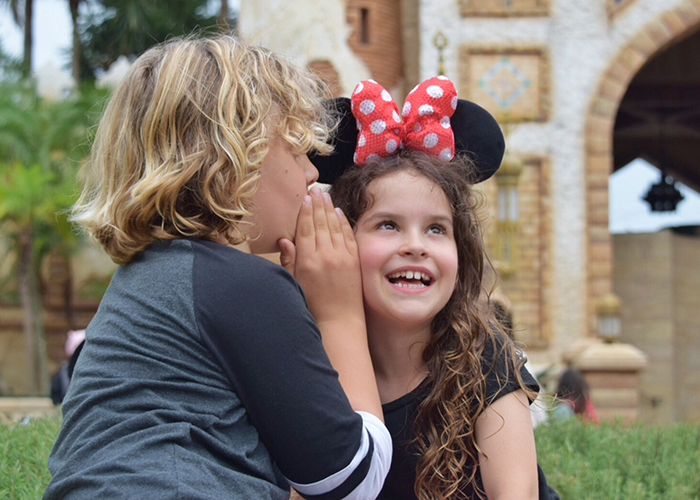 When the kids aren’t clambering across rope bridges or scooting in and out of coral as they explore all the secret passages of Ariel’s Playground, they’re checking out its collection of cute and quirky rides. They giggle wildly at Jumpin’ Jellyfish, spin out at the Whirlpool cup ride, get their ups and downs as the Flounder Flying Fish Coaster rockets around its track and float about on the gorgeous Blowfish Balloon Race ride. The whole place has such an enchanting feel that we’re ready for Arial herself to swim up and say hi when we stop for a quick refreshment at Sebastian’s Calyspo Kitchen. Just when we thought we couldn’t be more impressed, we stumble into the Arabian Coast, a port of call combining Aladdin’s Agrabah with the exotic waterfront world of Sindbad’s 1001 Arabian Nights to stunning effect. We wander through medinas and bazaars and down alleyways past piles of brass lanterns that look like they might just house a genie. 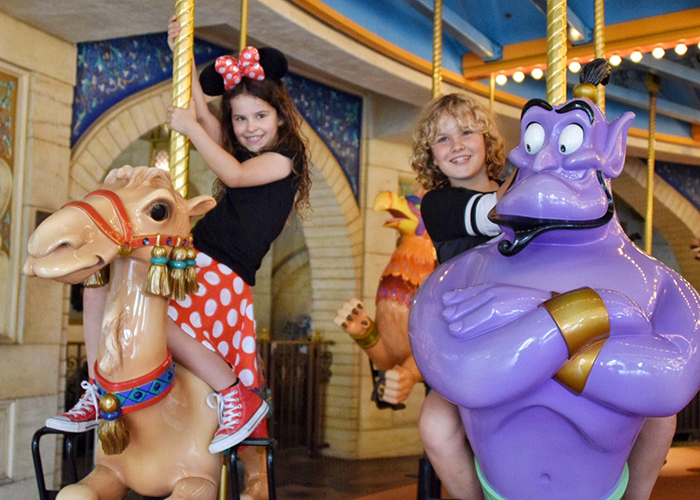 The kids leap onto the gorgeous Caravan Carousel, a double-decker carousel that can hold over 190 passengers, Raffles on the back of genie himself, while his sister rides a camel like she stole it. One of the most delightful attractions in the park is the captivating Sindbad’s Storybook Voyage, a dark ride along a river that appears to be a watery interpretation of Disneyland’s iconic “It’s a Small World”, only way better according to Raffles and Sugarpuff, both of whom are bewitched by the seamless animatronics, soundtrack and effects. We float through storms, past hip-swivelling belly dancers, seductive mermaids, pillaging pirates and jolly giants as we follow Sindbad on his adventures with super-kawaii tiger Chandu, who totally steals the show. 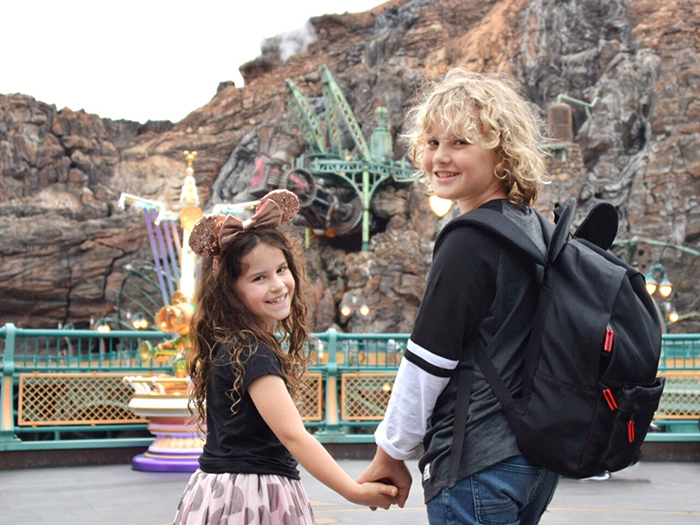 The only thing more enchanting than the ride itself are the awestruck expressions on my babies’ beaming faces.This is definitely one of the best rides at Tokyo DisneySea with kids. In the retro-future world of volcanic Mysterious Island we ooh and aah over the steaming sight of Mount Prometheus at its centre. But while some kids might like to scare themselves silly hurtling through the subterranean caverns of a volcano on Journey to the Centre of the Earth, or delving into the deep aboard a submarine on 20,000 Leagues Under the Sea, Raff and I err towards cowardly and are happy to just explore and soak up the super cool steampunk vibes. Sugarpuff prefers to herself amused by washing her hands over and over again at the funky wash station, entirely due to it dispensing Mickey Mouse-shaped soap foam into her hand. We take it up a notch at the Lost River Delta, an ancient site hidden in the depths of an Amazonian jungle. It’s here we bump into the world’s most famous mouse, Mickey Mouse, who is off on an archaeological dig with his pals. But he has time to stop and say hi, snuggling up and stealing kisses from my wide-eyed Minnie Mouse wannabe before heading off on his expedition. As we say goodbye to Mickey, the Yucatan Base Camp Grill proves just the spot to fuel up, Raffles devouring a lovely piece of salmon, while Sugarpuff gobbles tasty chorizo sausages from the smoky grill. Raffles readies himself for his next big move, to take on Indiana Jones: Temple of the Crystal Skull. 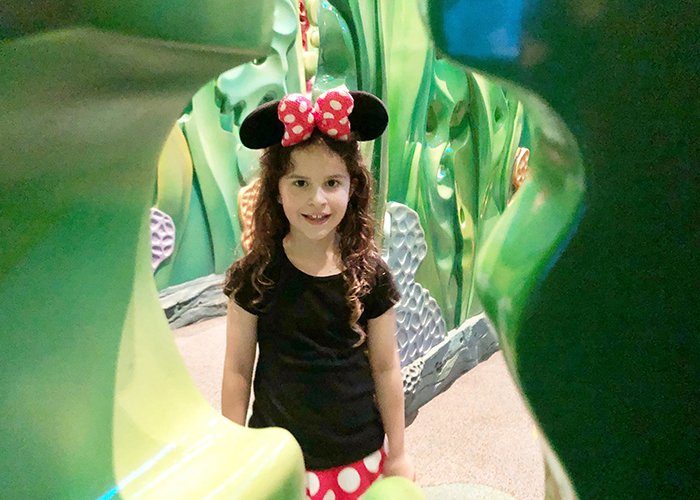 It’s another dark ride, and though she’s eager to join us we decide it’s best for seven-year old Sugarpuff to sit this one out, and she waits it out with one of our travel companions. The ride sends us rocketing through darkened tunnels past gruesome mummies, scuttling scarab beetles and slithering snakes, dodging fiery blasts and rolling boulders! We whoop and holler with glee, Raffles declaring this the best ride of the day and begging to line up to go again and again. But time is not on our side and we need to race back to Mediterranean Harbor to grab front row seats for the ultimate Disney extravaganza, Fantasmic! With laser lights, animated projections and pyrotechnics, Disney’s most beloved characters come to sparkling, dramatic life. Mickey Mouse is the Sorcerer’s Apprentice, conjuring up dancing water, lasers and fireworks as he fights against the evil forces of Ursula and Maleficent and battles fire breathing dragons. It proves a spectacular end to what has been our most exciting Disney day yet. 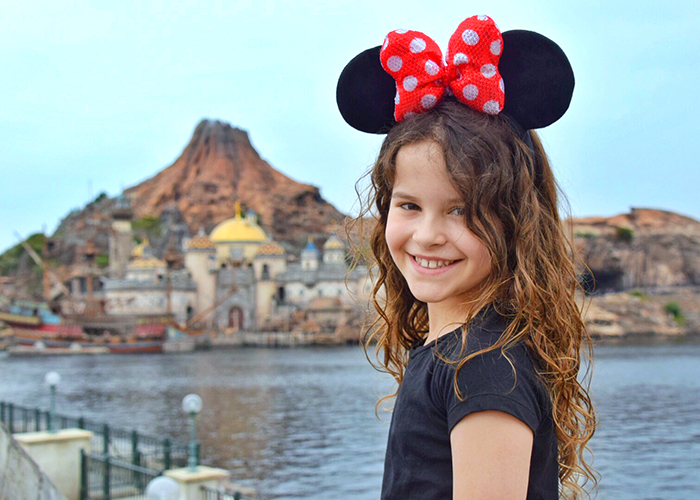 Authentically Disney, yet distinctly original, a visit to Tokyo DisneySea has sprinkled a whole lot of magic on our little family, and it is ready and waiting to do the same to you and yours. 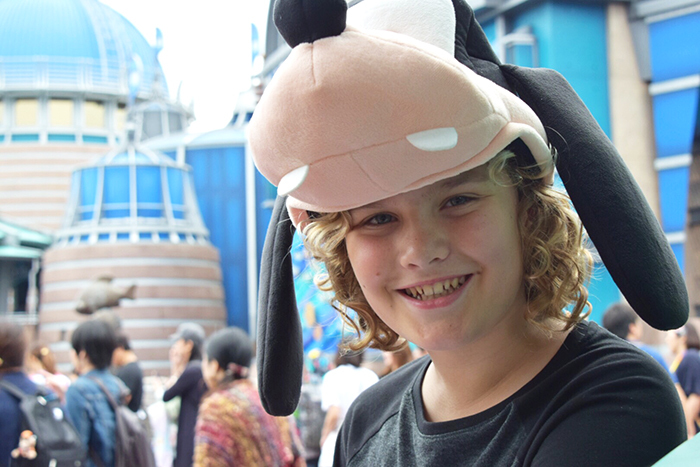 Disclosure: Our visit to Tokyo was supported by Tokyo DisneySea but as always, all opinions are our own.